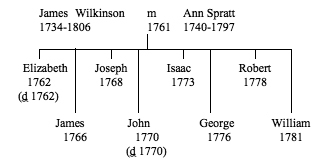 The earliest record found of Wilkinsons in Crich is the marriage of Edward Wilkinson in 1614, but a continuous line of Wilkinsons in Crich can only be traced with a high degree of certainty back to the birth of James Wilkinson in 1734. James was the son of John and Elizabeth Wilkinson (nee Storer) who were both living in Heage at the time of their marriage in 1718 in South Wingfield parish church. He married Ann Spratt, also from Crich, in the Parish Church of St Mary’s, Crich, in 1761. James and Ann were my four-x-great grandparents, and this is an account of their descendants and families in Crich until 1915, when the last remaining family members moved to Ripley and thus ended a direct association with the Parish of almost 200 years. I have focused primarily on the direct line which led down to myself and my sister, Joyce, but also touched on other family members who had lives which were closely linked with this direct line, or were interesting in some way (to me anyway! ), and for whom I was able to obtain information other than just dates of birth, marriage and death. Aspects of day-to-day life, such as employment, education and religion, are covered, and build up a picture of a hard-working, devout family who would have played their part in community life. Any further information about the family, or other families with a Wilkinson connection, will be very welcome. Without time-consuming research of Parish Registers (not yet carried out) it is not possible to get an overall picture of where in Derbyshire there were Wilkinsons before 1841 (this being the first year in which a national census provided a list of all the people living in each household and for which detailed records still exist). The Hearth Tax Returns of 1670 listed a total of seven Wilkinson households in Derbyshire, none of whom were in Crich. These Returns only related to property-owners, but the majority of people at that time rented their homes or lived in tied accommodation and so would not have been included. a central belt which included Crich, stretching from Wirksworth in the west to Heanor in the east. Compared to other parishes in these four areas, Crich did not have an exceptionally high concentration of Wilkinson families. Edward Wilkinson married Ellen Whylde of Wessington in the Crich Parish Church in 1614. Ellen died only five years later in 1619, and there are no records of any children. Two children, William and Rosamund, were born to Henry and Rosamund Wilkinson in 1671 and 1674 respectively. The parish register records from 1600 – 1657 are difficult to read, although a transcript has been produced; there may be records that have been missed by the transcript. The next parish register entry is the baptism of James Wilkinson in 1724. Another baptism of a James Wilkinson took place in 1734. Both were the sons of John Wilkinson and Elizabeth (née Storer) of Heage, indicating that the first-born son had died. John and Elizabeth had been married in South Wingfield church in 1718, and their first child was a daughter, Elizabeth, born in 1719. John could have been the son (born 1681 in Heage) of James Wilkinson and Ellen (née Selby). Joseph, Robert and William can be traced with confidence through subsequent marriage, baptism and census records. James and Isaac have not subsequently been traced (yet!). George has also not been traced under his baptised name – but see section ‘The early 1800s below. There was a Wilkinson family – Edward and Ann (née Spencer) and their seven children - living in South Wingfield in the second half of the 18th century, possibly (but not conclusively) linked to the Crich family. In 1811 there were four Wilkinson families in the parish, the families of Robert, Josh (Joseph), William and David Wilkinson, all depending on agricultural labour for their income. Robert, Joseph and William were most probably the sons of James and Ann. David may have also been their son but not baptised with this name, but this is currently speculation; subsequent records for David suggest he was born around 1776 in Crich, the same year as their son George was born and for whom no other records have yet been found. Josh’s and Robert’s households each comprised four people, with seven people in both David’s and William’s households, a total of twenty-two people (who might not all be Wilkinsons, as only the numbers of males and females were recorded, not the names). We have this much information for 1811 because, exceptionally, the census records for Crich for both 1811 and 1821 have survived, and are kept in the County Records Office. In 1821, there were still four Wilkinson families in the parish, all relying on agriculture, but not quite the same four as in 1811. William’s family had moved to Lancashire, and had been replaced by that of John Wilkinson, whose origin is uncertain (but who could have been one of the children of Edward and Ann Wilkinson, of South Wingfield). Robert’s and Joseph’s households now contained eight people each, there were six in David’s household and nine in John’s – a total of thity-one people. This was the largest number of Wilkinsons recorded in Crich at any one time. Again, they may not all have been Wilkinsons – some could have been lodgers. The families would have been aware of the problems besetting the framework knitting trade in this period but their reliance on agricultural work, although not well paid, may have cushioned them from the extreme suffering experienced at times by those directly involved in framework knitting. This cottage industry had become established in Crich in the late 18th century, in association with the rapidly developing textile mills in the East Midlands and in the nearby Derwent Valley in particular. Local people would have been suffering as low pay and the introduction of machines which produced inferior quality goods made it hard to earn a decent living, and Crich suffered from a number of incidents of stocking frame breaking. Local protests culminated in the Pentrich Revolution of 1817, which began with a march from South Wingfield and ended disastrously at Kimberley near Nottingham when the protesters were intercepted by the 15th Regiment of Light Dragoons. A William Wilkinson of Swanwick was one of the marchers, but I have found no evidence yet to prove that the William Wilkinson living at Crich in 1811 was the person concerned. However, as mentioned above, he had left the area by 1821, with the last record for him in Derbyshire being the baptism of his son David in 1816. Robert – my three-x-great-grandfather - was the seventh child of James and Ann, born in 1778. He married Hannah Bennett at Horsley Woodhouse in 1798 and they had ten children, of whom only five survived into adulthood – Betty (1809), Robert (1811), David (1816), Maria (1818) and William (1821). Described in the parish register entries for his children’s baptisms as an ‘agricultural labourer’, by 1836 he was, nevertheless, the owner of his house and garden on Sun Lane (near the Market Place in the Tors area) and of a separate nearby garden, and was included on the 1836/37 Register of Electors as the owner of freehold property. Although he may not have been wealthy, he was clearly relatively better off than many people in those days. Property ownership gave Robert the right to vote (possibly under the limited extension of franchise given by the 1832 Reform Act), but also brought the obligation to pay taxes. He is listed in the 1839 Poor Relief Assessment as paying 81/2d for his house and garden and 3/4d for the separate garden, and in the 1839 Church Rate Records as paying 15 shillings. Robert and Hannah, along with Robert’s brother William and his wife Mary, are the first generation of the family with a known link to the Methodist movement. Three of Robert and Hannah’s children were baptised in the Cromford Wesleyan Church, commencing with John in 1813, then Maria in 1818 and William in 1821. In between these dates their other children were baptised in Crich Parish Church, reflecting the common practice in those days of people attending both Anglican and Methodist churches. However, it is puzzling why they chose to go to the Cromford Church (built in 1808) when there was already a Wesleyan Chapel (built in 1765), on Chapel Lane, just a short distance away from their house. Perhaps it was to do with the quality of the sermons or the personality of the preachers – certainly it was a long walk they chose to take to attend chapel. Robert and Hannah both died in 1850, and the house on Sun Lane then became the home of their son David (born in 1816) and his wife Ellen and their children. David, aged 25 (Robert and Hannah’s son), his wife Ellen, and their first two children William and Emma. David Wilkinson and his wife Sarah (both now aged about 65). David Wilkinson (born 1804) and his wife Margaret (probably the son and daughter-in-law of David and Sarah). This David was less fortunate than the rest of the family. He and his brother, William, were each apprenticed to local tradesmen at a young age and his two sons, David and Joseph (by his second wife Millicent) were in the Union Workhouse in Belper in 1871, following the death of both their parents. John Wilkinson, aged 45 (who could have been the eldest son of the John Wilkinson whose family was listed in the Crich 1821 census). By 1841 the occupation of the men was not exclusively in agriculture. Although Robert Wilkinson senior was still an agricultural labourer, his sons Robert and David were railway labourers (the North Midland Railway line from Derby to Leeds, which passed through part of the Parish at Bullbridge, had opened in 1840), and John was a framework knitter. Robert junior’s wife Ann was also listed in the census as a framework knitter (they had no children). My great-great-grandfather David Wilkinson (1816 – 1897) was born and spent most of his life in Crich although, at the time he married Ellen Thawley at Alfreton Parish Church in November 1838, both he and Ellen were living in Riddings. Ellen was originally from Stretton in the Parish of North Wingfield, the daughter of tailor William Thawley and his wife Docea, but she was orphaned by the age of nine. After David and Ellen were married, they moved to Crich and brought up seven children. There were five boys - William (1839), James (1844), twins George and Henry (1846), and David (1850); and two girls - Emma (1841) and Hannah (1853). Another daughter Eliza (born 1843) died before her first birthday. Surprisingly, although the1836 Civil Registration Act required that from 1st July 1837 all births in England and Wales should be civilly registered in addition to any church baptism record, the births of the first three children and the seventh (my great-grandfather, David junior) were never registered. Was this to do with the fact that in the early days of Registration it was the Registrar who went to the parents, rather than the other way round, and bad weather may have prevented or discouraged a journey to Crich? Certainly two of the unregistered births took place in winter, but the other two were in October. Or did they just not get round to it? David’s occupation in the early years of his marriage was given, on the baptism records of his children, as labourer, but by 1845 he was described as a stone-getter and by the 1851 census he had progressed to become a stone mason. During the 1850s and 1860s David and Ellen’s children were growing up, and the household income increased as their sons one by one began working in the local quarries. In 1844 the Butterley Company had opened a new quarry, Hilts Quarry, and in 1846 George Stephenson’s Clay Cross Company had begun to transport limestone from Cliff Quarry down the tramway to Ambergate, developments which increased employment for stone workers. E. J. Varty writes1 that ‘there was a tendency for sons of quarrymen to take up similar work as soon as they were old enough’. This was certainly true for the Crich Wilkinsons, with three generations employed in quarrying during the course of the nineteenth century. In 1854 David was one of the original trustees who established the Moorwood Moor Methodist church, along with his brother Robert, who was by then a framework knitter living at Plaistow Green. Thus they continued the involvement of the family in the Methodist movement which had begun a generation earlier. It is possible that David used his masonry skills in the building of this church, or the Primitive Methodist Chapel which opened in Sun Lane Crich, in 1855, just a short distance from the house the family lived in at that time. At least two of David’s sons, Henry and James, and two of his grandsons, Albert and Frederick, became lay preachers and were closely involved with Methodist churches in Crich and later Ripley. Sadly, David and his family suffered a major blow when Ellen died in 1870, aged fifty-six. Some time between 1861 and 1871 the house on Sun Lane appears to have been sold, as by 1871 David was no longer on the electoral register, and the family – much smaller now - had moved into a house on The Common. William, the eldest son, was married but still living in his father’s home, together with his wife Alice, and David junior (my great-grandfather), the youngest son. David’s grandson, James Henry Shillito, the eldest son of his daughter Emma, was also living with them. A number of other changes within the family had also taken place: the elder daughter, Emma, was also married but living in Nottingham; the younger daughter, Hannah, was working as a servant in Nottingham; George was married and living with his in-laws in Cromford, working as a stone mason; Henry was in lodgings nearby, working as a framework knitter; and James – the only one who apparently had an urge to see the world – was in the Royal Marines, part way through a twelve-year service period which would see him travel to the Middle East several times on HMS Arethusa. The only other Wilkinsons still living in Crich in 1871 comprised David’s brother, Robert, and his wife Ann, both working as framework knitters at Crich Green; and David’s sister, now Maria Pykett, living at Crich Carr with her husband and only child Rebecca. In 1872, David married again, this time to a widow from Cromford, Mary Walters. They lived in Crich to start with, and in 1881 were still looking after James Shillito, his mother Emma having died of cancer in 1877. This was an example of how families looked after each other, and especially the children, in times of hardship. At some time towards the end of the 19th century, David switched his occupation from stone masonry to herbalism (or medical botany, as it was sometimes described), and by 1881 had moved to Ripley and established an herbal medicine practice there. This was a surprising change, because it was an unusual occupation, and not one linked with his previous employment. Had he (and possibly other family members) been engaged in herbalism in a small way for many years before deciding to set up in business? Had the additional garden plot which David’s father had owned back in the 1830s been used for growing herbs? David Wilkinson Junior (1850 – 1890) was my great-grandfather. In 1873, at the age of twenty-three, he married Mary Broadhurst, the daughter of local farmer Daniel Broadhurst. Daniel had been farming at Coddington since at least 1841, when the census records him as being a farm labourer living at the farm with his wife Ann. On the 1851 census he was described as a farmer of 24 acres and the head of the household, so probably he had been able to take over the farm tenancy after the previous farmer had died. David and Mary would probably have known each other as children in the village. They had six children; five boys - Albert Edward (the eldest, born in 1874, was my grandfather), Noah James, Frederick Herbert, Daniel Broadhurst, and David Harold - and one girl, Ann Elizabeth Ellen, and continued to live in Crich until David’s relatively early death in 1891 from emphysema, a lung condition no doubt aggravated by the dust associated with his work as a stone mason. He had followed his father into the quarrying industry, as had two of his brothers, although he is listed in Kelly’s Directory for 1881 as both a stone mason and a shop-keeper. This was the first generation of the family known to have received a formal education. All six children of David and Mary’s children attended the British School, which from 1885 was in a building which still exists today as Crich Junior School (known locally as the Bottom School). This choice of school was probably deliberate, yet another indication of the family association with Methodism. The British School was a ‘voluntary’ school run by the non-conformist churches, whereas the other village school further up the hill, known as the National School, was run by the Church of England. For many years there was bitter rivalry between the two schools, which is well documented2. The early registers for the British School are in the Derbyshire County Record office, and the attendance is recorded of all six of David and Mary’s children, starting with Albert Edward in 1883. When David died, Mary was left with four children under twelve to support, the youngest only a few months old. Mary’s occupation on the school register entry for her son David Harold in 1893 was given as ‘grocer’ so there was obviously still a family shop to provide income. The two eldest sons were at work by then, one as an apprentice stone mason, the other as a framework knitter and their wages would have helped a little. Henry Wilkinson (1846 – 1930) was one of David Wilkinson junior’s older brothers. By 1892 he had been widowed twice - the first time, tragically, only six months after his marriage to Elizabeth Allsop in 1874. In 1877 he married Margaret Massey of Bonsall, and they had two daughters, Emma Jane and Mary Ellen, and lived in Crich until Margaret’s death in 1892. It would not seem surprising then that, in the very least as a practical arrangement so that their respective children had two parents to care for them, Mary and Henry should marry, and so they did, in 1894. They would have known each other very well, being related by marriage for many years in a close-knit family. They continued to live in Crich, and had a child of their own, William Percy, in 1896. By 1901 they had moved to Crich Carr and were living with four of Mary’s children by her first husband David. The two younger ones, Ann and David, were still at school and the two older ones, Albert and Daniel, were working as stone masons. Another of her sons – Noah – was already married and living next door with his wife Mary and two young children. The two families lived near to Crich Carr Methodist Church and were closely involved in church life. Henry was the Superintendent of the Church, and Noah’s wife, Mary (nee Kirkland) was a Sunday School teacher, as was her sister, Bertha Kirkland, who married Noah’s elder brother, Albert, in 1903. Both couples married in Belper Primitive Methodist Church (the church at Crich Carr not being licensed for marriages). Albert was a Sunday School teacher, a trustee, and also a lay preacher. By 1911 Henry and Mary’s family home was very crowded, containing five of Mary’s grown-up children (all of them except Albert, who was now married and living in Darley Dale), their son Percy aged fourteen, and three grandchildren. One of the grandchildren was Noah’s son, Harold, Noah’s wife Mary having tragically died following the birth of their third child (named Mary after her mother). Noah’s two daughters, Mary and the eldest child Edith, were being looked after in the house next door by their maternal grandmother, Ann Kirkland. In his early life Henry had mainly been employed in framework knitting, but by 1881 he had joined his father, David Wilkinson senior, as an herbalist in the business at Ripley, whilst continuing to live in Crich. However, in 1915 Henry and Mary moved to live over the business in Chapel Street in Ripley, thus ending an unbroken period of Wilkinsons living in Crich going back to at least 1734. (One of Henry’s brothers, James, who had served in the Royal Marines from 1863 to 1875 and then gone back to his original occupation as a stone mason, had by 1895 also become an herbalist and joined the family business). Henry continued his Methodist association, this time with the Ebenezer Church in Ripley, until he died in 1930, Mary having passed away three years earlier. Two of Mary’s sons – Daniel and David - who served in the army in World War One are listed on the Roll of Honour in St Mary’s Church. The business in Chapel Street, Ripley, continued trading as D. Wilkinson & Sons until the 1960s. Although there were no Wilkinsons living in the parish after 1915, Henry and Mary’s families still maintained links with relatives and friends in the area. My grandfather Albert Edward, and subsequently my grandmother Bertha (née Kirkland), chose to be buried at Crich, despite not having lived there for over forty years. I recollect that my grandmother used to walk from Ripley to Crich every week until she was in her eighties.